Clawed lobsters comprise a family (Nephropidae or Homaridae) of large, marine crustaceans, with long antennae, stalked eyes, and five pairs of jointed legs, including one pair modified into large, pincer-like claws. "True lobsters" sometimes also include the closely related families of Thaumastochelidae and Enoplometopidae. 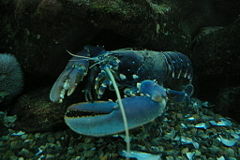 In a more general sense, the term lobster also is used with respect to several other groups of crustaceans, including the spiny lobsters (family Palinuridae) and the slipper lobsters (family Scyllaridae), which have no claws, and the squat lobsters (families Galatheidae and Chirostylidae), which are more closely related to the hermit crabs. The spiny lobsters, which are a type of marine crayfish, are also known as rock lobsters, crayfish, sea crayfish, and crawfish. 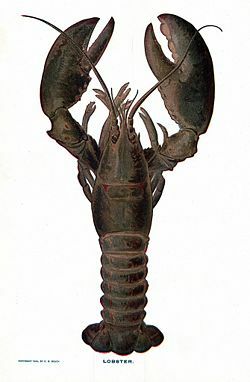 However, the clawed lobsters, and particularly the genus Homarus, are most often associated with the name and will be the focus of this article. The closest relatives of clawed lobsters are the reef lobster Enoplometopus and the three families of freshwater crayfish. As with other taxonomic groups, lobsters do more than just provide for their own survival, development, maintenance, and reproduction: they also are integral to their ecosystems as part of food chains and they provide value to humans. Lobsters are an economically important type of seafood, the basis of a global industry that nets US$1.8 billion in trade annually. And beyond meeting nutritional needs, lobsters also touch upon inner values in terms of adding to the experience of nature, and providing new sensations of taste and texture. Nonetheless, overfishing has placed significant pressures on lobster populations. In recent years, concerns have been raised about the means of preparing lobsters for consumption, which popularly involves their being placed live into boiling water. Smaller varieties are sometimes called "lobsterettes." Lobsters are invertebrates, and have a tough exoskeleton, which protects them. Like most arthropods, lobsters must molt in order to grow, leaving them vulnerable during this time. During the molting process, several species may experience a change in color. Lobsters typically eat live food, consisting of fish, mollusks, other crustaceans, worms, and some plant life. Occasionally, they will scavenge if necessary and may resort to cannibalism in captivity; however, this has not been observed in the wild. Lobster skin in the stomachs of lobsters has been found before, although this is because lobsters will eat their shed skin after molting (MarineBio 2006). Lobsters grow throughout their lives and it is not unusual for a lobster to live for more than 100 years (Wallace 2005). They can thus reach impressive sizes. According to the Guinness World Records, the largest lobster was caught in Nova Scotia, Canada and weighed 20.14 kilograms (44.4 pounds). Being arthropods, lobsters are largely bilaterally symmetrical. Clawed lobsters often possess unequal, specialized claws (chelae), like the king crab. A freshly caught lobster will have a claw that is full and fleshy, not atrophied. Lobsters have a cephalothorax, which is the head fused with the thorax, both of which are covered by the carapace of chitinous composition. The other major body division is the abdomen. The lobster's head consists of antennae, antennules, mandibles, the first and second maxillae, and the first, second, and third maxillipeds. Because a lobster lives in a murky environment at the bottom of the ocean, its vision is poor and it mostly uses its antennae as sensors. Studies have shown that the lobster eye is formed with a reflective structure atop a convex retina. In contrast, most complex eyes use refractive ray concentrators (lenses) and a concave retina (Land 1976). The abdomen of the lobster includes swimmerets and its tail is composed of uropods and the telson. In general, lobsters move slowly by walking on the bottom of the sea floor. However, when they are in danger and need to flee, they swim backwards quickly by curling and uncurling their abdomen. A speed of 5 meters per second has been recorded. Lobster has traditionally been a plentiful food item, so plentiful in fact that it also served as bait to catch fish prior to the end of the nineteenth century (Herbst 2001). Today, its popularity and price limit its commercial use to serving as a delicacy. The European wild lobster, among which the best is the royal blue lobster of Audresselles, is more expensive and rare than the Canadian lobster but was always appreciated chiefly among the royal and aristocratic families of France and the Netherlands. Such scenes were depicted in Dutch paintings of the sixteenth and seventeenth centuries. 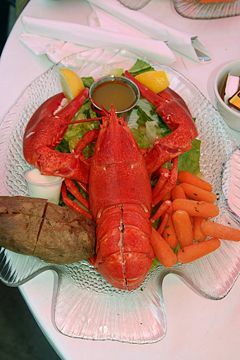 In North America prior to the twentieth century, local lobster was not a popular food. In the Maritimes, eating lobster was considered a mark of poverty. In some parts of the Maritime provinces of Canada, lobster was used as a fertilizer for farmers' fields, and a great deal of lobster was fed to slaves or the lower members of society. Outside of the rural outports lobster was sold canned, losing much of its flavor, which can be disguised if the lobster is dipped in drawn butter. The reputation of lobster changed with the development of the modern transportation industry that allowed live lobsters to be shipped from the outports to large urban centers. Fresh lobster quickly became a luxury food and a tourist attraction for the Maritimes and Maine and an export to Europe and Japan where it is especially expensive. 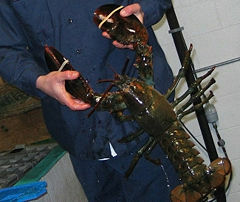 The expense of eating lobster has led to supermarkets selling "faux lobster" (which is clearly labeled as such), and it is made from fish that has been altered to look and taste similar to lobster. A few restaurants have gone so far as to sell "langostino lobster." Langostino translates into prawn, however the actual animal is, more likely than not, a crab. The usual method of catching lobsters has been to use baited, one-way traps located deep underwater with a coded marker buoy at the surface so that fishermen can find their cages and not pull up someone else's traps. Around the year 2000, due to overfishing and demand overwhelming supply, many countries began to try lobster farming, which is similar to fish farming. Lobster is best eaten fresh, and they are normally purchased live. Indeed, bacteria can quickly multiply in a dead lobster and unless kept in seawater, lobsters "must be purchased the day they're to be cooked" and either "cooked live or killed immediately prior to cooking" (Herbst 2001). Lobsters are usually shipped and sold with their claws banded to prevent them from injuring each other or the purchaser. Lobsters cannot open and close the claws when they are banded, which causes the claws to begin to atrophy inside the shell. Very fresh lobsters will not show this, and the claws will be full. Many restaurants that serve lobster keep a tank of the live creatures, often allowing patrons to pick their own. If the lobster is to be boiled or steamed, most cooks place the live lobster into the pot. If the lobster is to be fried, grilled, or baked, it is best not to boil the lobster before further cooking. Freezing the lobster may toughen the meat. When boiling a lobster, the general rule of thumb is to simmer the lobster for 5 minutes for the first pound and 3 minutes for each additional pound. The majority of the meat is in the tail and the two front claws, but smaller quantities can be found in the legs and torso. The larger the lobster the greater the proportion of meat in the small legs and body. Lobster can be consumed simply, boiled or steamed, or used in a wide array of dishes and salads. It can be served as lobster soup or bisque or mixed with mayonnaise for lobster rolls. The issue of whether or not lobsters are capable of experiencing pain remains contested. A Norwegian study released in February 2005 suggested that lobsters were unable to feel pain (Sømme 2005), while a Scottish study released in the same year, among other studies, concluded that lobsters probably can feel pain (AFA 2005). The most common way of killing a lobster is by placing it in boiling water. This method is controversial because some people believe the lobster should be de-sensitized beforehand by placing it in a freezer for some time. Boiling lobsters alive is illegal in some places, such as in Reggio Emilia, Italy (Johnston 2004). The Norwegian study states that the lobster may be de-sensitized by placing it in a salt-solution 15 minutes before killing it. The quickest way to kill a lobster may be to insert a knife into its head and cleave the head in two, thereby destroying two of the most important nerve clusters of the lobster. Some feel that this is more humane than placing the live lobster into boiling water. Freezing the lobster for 15 minutes to 2 hours before boiling may de-sensitize the lobster, although no proof of this exists. In addition, this freezing will delay the preparation of a lobster dish in the restaurant. Some stores will kill a lobster upon purchase by microwaving it. Whether or not death occurs more quickly than when the lobster is dropped in boiling water is not clear. There are, however, locations where the sale of a dead lobster to be eaten is illegal, including Massachusetts in the United States (Massachusetts General Court 2007). In 2006, British inventor Simon Buckhaven invented the CrustaStun, which electrocutes lobsters with a 110 V electric shock, killing them in about five seconds (BBC 2006; Koerner 2006). This ensures a quicker death for the lobster. Seafood wholesalers in Britain already use a commercial version. Advocate for Animals (AFA). 2005. Cephalopods and decapod crustaceans: their capacity to experience pain and suffering. Advocates for Animals. Retrieved May 12, 2015. British Broadcasting Company (BBC). 2005. Lawyer invents lobster stun-gun. BBC News June 18, 2006. Retrieved April 25, 2007. Johnston, B. 2004. Italian animal rights law puts lobster off the menu. Daily Telegraph March 6, 2004. Retrieved May 12, 2015. Koerner, B. I. 2006. How a lobster leaves the building. New York Times June 25, 2006. Retrieved May 12, 2015. Land, M. F. 1976. Superposition images are formed by reflection in the eyes of some oceanic decapod Crustacea. Nature 263: 764-765. MarineBio. 2006. Homarus americanus, Atlantic lobster. MarineBio. Retieved December 27, 2006. Massachusetts General Court. 2007. Chapter 94: Section 77G. Use of dead lobsters for food purposes; rapid freezing of live lobsters. The General Laws of Massachusetts. Retrieved April 25, 2007. Sømme, L. 2005. Sentience and pain in invertebrates: Report to Norwegian Scientific Committee for Food Safety. Norwegian University of Life Sciences, Oslo. Tshudy, D. 2003. Clawed lobster diversity through time. Journal of Crustacean Biology 20: 178–186. Wallace, D. F. 2005. Consider the Lobster and Other Essays. Little, Brown & Company. ISBN 0316156116. This page was last modified on 12 May 2015, at 16:32.